An old style bell alarm clock, but battery operated. Set alarm and a hammer bashes bells, ringing loudly to wake you up. But don`t let the old fashioned design fool you. This works from 1 AA battery, so there`s no need for winding up and losing sleep. Look over at the clock face and the hands are luminous. Press a button on top of the 16.5cm x 10.5cm x 5.4cm / 6.24 in x 4 in x 2 in clock and a light illuminates the face. But don`t let the modern features fool you. There`s an old world feel. Be transported back about 100 years to the rural outskirts of Bologna in Spain. Here the Borghesani family laboured creating probably the most delicious olive oil. 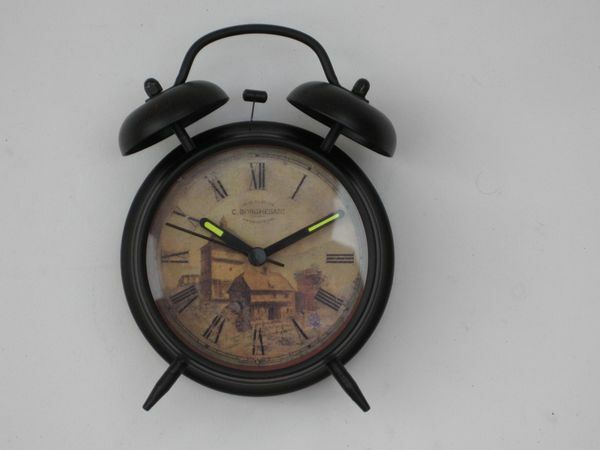 That`s the ancient C. Borghesani Olive Oil workplace on the clock face. Dreamy dreams of Spain, olive oil and Spaghetti Bolognese. Until the bell alarm clock wakes you up! Bell Alarm Clock text, images and video are copyright.